Over the past fifty years, certainly since the 1960’s, un-married and married Bermudian couples have chosen to have fewer and fewer children. This pattern is replicated throughout all the developed western economies, which includes Bermuda. This creates a huge problem for Bermuda. Before the 1960’s, in the developed western economies women had limited control over their bodies and their ability to avoid pregnancies. Since the 1960’s, women have gained almost complete control of their bodies. Today’s child-bearing age woman is far freer and far more in control of her body and her quality of life than her mother and grandmother. The 2015 Registrar General’s Report on births and deaths confirms that Bermudian couples and Bermudian single women have been making decisions about their quality of life. Most couples and single women realize the high and full cost of raising a child, so most have chosen to have fewer children. For the first time, in 2014, the Registrar reported that more Bermudians died than were born. Happened again 2015. The numbers reported are 478 deaths in 2014 versus 441 births. For 2015, 457 deaths versus 437 births. In those two years, 57 more deaths than births. Between 2014 and 2015, 878 Bermudians were born while 935 Bermudians died. Absolutely, this is a negative birth rate. Absolutely, Bermudians are now dying faster than they are being born. Decisions about creating life are not made by statisticians, politicians, or economists. Instead, these decisions are made by the ordinary Bermudian women and Bermudian couples who you see every day. Only 437 Bermudians were born in Bermuda in 2015. Assuming that 50% are female, then eighteen years from now, there will be – there can only be – 219 Bermudian women entering the child-bearing stage of life. Statisticians, economists, and demographers tell us that – without immigration – in order to prevent a population decline in any national population, every woman in each new age cohort of women of child-bearing age must give birth to two children. If some women do not, then other women must have more than two children in order to compensate. Thus those 219 Bermudian women born in 2015 must later have two babies each, thereby giving a birth cohort of 438 Bermudians; or some women must have more in order to compensate for their ‘sisters’ who choose to have none or one. Clearly, absolutely, ‘en masse’, Bermudian couples and single women have chosen to have fewer babies than that minimum replacement two. These collective decisions by hundreds of unconnected couples and women results in today’s entirely predictable situation – a negative birth rate. This is what the Registrar General reports for Bermuda for 2014 and 2015. This means that as the years pass, without immigration, Bermudians – us lot – will disappear off our own coral atoll at 32n64w, North Atlantic Ocean. It may take a while, but without immigration, it is mathematically certain. It is also a problem that is affecting all of us now. Until now, Bermudian policy-makers have dealt with this problem by granting Bermuda Status. Between Censuses 2000 and 2010, there were 1,818 grants of Bermuda Status. As far as I can learn, between 2010 and 2015, there have been just over 1,200 additional grants of Bermuda Status. But even with this rate of granting Bermuda Status [the vast majority to spouses], the number of Bermudians is still dropping. Why? Because of un-measured Bermudian emigration and un-measured Bermudian student non-return. Five months from now, the mini-Census now underway will tell us that in 2016, there were only about 50,000 [or fewer] Bermudians in Bermuda. If I am right, and I believe that I am, then we have a massive – but virtually invisible – national problem. The unfolding of this hard-to-see problem will help create a steep rise in social tensions that will be stoked and fired up by all the spooks and spectres from Bermuda’s bad racial legacy. In 2016, us Bermudians are – literally – a dying breed. 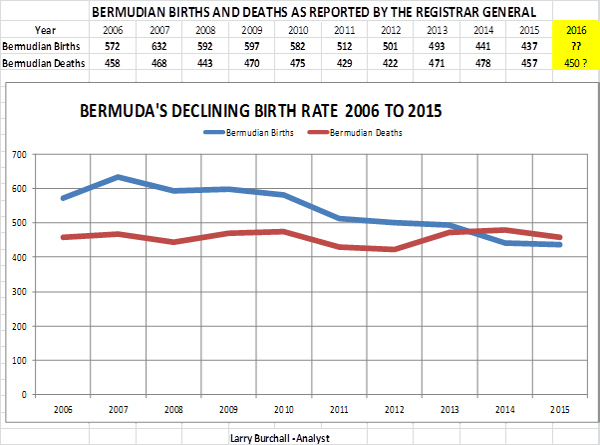 To show you exactly what the Registrar General is reporting, here is a chart showing Bermudian birth and death facts from 2006 to 2015. Note when the ‘death’ line crosses the ’life’ line. Note the downward trend of that birth or ‘life’ line. The ‘life’ line is the outcome from hundreds of personal decisions by hundreds of individual Bermudian women and Bermudian couples. Note also how steeply downward it trended once the 2009 recession hit. So what do we do to fix this, Larry? We know you’re against immigration reform… so are you simply doing a Dame Lois and encouraging people to go multiply? Make it easier for people to have children. Stop shaming people for having kids and help them afford them. It’s not just kids of the wealthy who can, and do, contribute to society. Stop running this country like it’s a business with a board of directors filtering everything through the bottom line. Better yet…let women completely run the country for a while. Bring humanity back to the decision making. They are not running this country like a business… IT IS A BUSINESS!! Until the people realize that we are the chattel of the aforementioned company, we will always have the same problems. Do some research… the word PERSON and CORPORATION are synonymous. Every person is a corporation and is owned by the government!! “Stop shaming people for having kids and help them afford them.” HELP THEM AFFORD THEM??? Whaaaat? You expect society to PAY FOR YOUR KIDS? I don’t think so ma’am!!! If you CAN’T AFFORD THEM, DON’T HAVE THEM!!! Are you deaf of daft? The community needs human beings. Look around the world at other societies that are kinder to parents. A negative balance of humans is a problem. What gives you the impression that money prequalifies a person or family for raising children? Bermuda is in the top 3 most expensive countries. There are perfectly intelligent, capable persons who can’t afford to raise children in this country. Oh darlin’, it is you that is deaf AND daft. Yes, there are MANY perfectly intelligent, capable people in this country that can’t afford to have children so THEY DON’T HAVE CHILDREN! Why would someone have a child knowing they would need their neighbour to pay for it?? Duh. We may have a negative balance of humans, as you say, but it shouldn’t be rectified by a bunch of people that can’t afford the extra mouth to feed. C’mon, you act like these people are having babies as a civic duty. You and I know that isn’t true. Convenient excuse, but pathetic and untrue. Stop arguing, you are wrong. Mr. Burchall what has to be noted as well is that a large,as yet unknown, proportion of Bermudian women of child bearing age have emigrated out of the island. Many due to high costs of living in Bermuda for Bermudians. Hence children who would have been born in BDA are now born outside of BDA.Thus further contributing to lower number of births. What are we doing or planning to do to retain Bermudians in Bermuda versus persons advocating for non Bermudians to reside her permanently? The term for that sort of thing is called gentrification. Many have left to take advantage of education and other opportunities in UK and Europe. How is that gentrification…It is not…stop lying to people chris. ps how does granting status to someone who has worked as a gardener for 25+ years in Bermuda = gentrification? @hmmm – agreed on the lies part!! The 25 year residency part of there proposal is obviously a starting point which would almost certainly be changed once the bill is passed! Its a gateway if you will. I’m not opposed to the granting of status by any means. Actually quite the opposite. But I’m looking at the opposition’s argument for a change and trying to understand were they are coming from. Far too many people are quick to shoot down there concerns and ideas, which inevitably leads us nowhere. and what say you about the accidental gentrification by those of us who have children by foreign parents and/or marry foreigners thereby opening a pathway for others to claim Bermuda status by certain clauses (written and suggested for writing). and LB has already put the numbers up over what he believes to be the number fo Bermudians who have emigrated by the statistics alone. he is spot on with the assessment of the population decline and has spoken time and time again about the solution which is immigration (reform if you will) based and amounts to importing persons to these shores to increase the population which, by the way, does not mean MORE Bermudians will be out of work automatically. we have a problem in this country with unscrupulous business men and women who take advantage of the same “immigrants” we fear and pay them paltry salaries and then blame the same “immigrants” for taking “OUR” jobs. Hear hear Chris Famous. There aren’t to many things we can agree on but this happens to be one of them. Dislike all you want…the man has a point! How many are truly willing to see things from both sides of the coin on this argument? Instead of immediately getting defensive…. Bermuda is an expensive place to live because of Bermuda laws and taxes which kill competition and raise prices. - Bermuda has some of the highest import duties in the world. Bermudians could change these laws by next week and make the island a more affordable place to live. Bermudian women who left to live off the social net in the UK did so because they were raised (by a large majority) in single parent households by ill equipped or absent parents, they therefore did not prioritize education, made stupid decisions to sleep with men who never intended to be fathers and thus were left with a child, young, no employment opportunities in a very expensive country. The root cause is not the cost of living on this island, the root cause is the institutional family disfunction, one caused by generations of family disfunction that draws back to slavery in the western world. Don’t look at me. Daycare is, minimally, $800 per month. Healthy food is too expensive for me to grow anymore children. The best I can do is try to not pack the kids up and leave the island…again. No one is “looking at you” to procreate!! Please DON’T as you expect society to pay for it according to your comment up above. Again, if you can’t afford to have kids, DON’T HAVE THEM! In a related note, the other day there was an MP in Barbados who suggested paying married couples to reproduce. It was met, predictably, with the call of “with whose money”. Hi typical ignoramous. Look how ridiculously expensive this island is. “Can’t afford” is relative. And NOTHING compares to the expenses found on this island! NOTHING!!!! There are perfectly capable people who would not be very smart to bring more children into this environment with toxic idiots who don’t understand that money does not equal intelligence. Sounds like you need to move away….again. Cheaper places to live. Maybe somewhere that you won’t need your neighbours to pay for your children. You seem to be barking up the wrong tree and arguing a point that isn’t arguable. You are correct, BDA is expensive. No argument there. Why are you still arguing? Intelligent people don’t take on finical responsibilities (no matter where they live) if they don’t have the money to cover them. I don’t own a Rolls Royce at the moment because I cannot afford the upkeep. End of story, stop arguing. I don’t have children that I can’t afford. The fact that I can afford my kids does not blind me to the fact that there are people with reasonable amounts of education and reasonable careers who just can not afford this place. Yet…we ACT as if we care about the people who leave because they know that they can’t afford to stay. We ACT as if we’re in favour of doing what needs to be done to retain our population. Meanwhile…you think it’s appropriate to advise me to leave. p.s. A child does not compare to a Rolls Royce. You having a Rolls Royce will not positively impact anyone but yourself. Larry is correct, except that my conclusions would be that decline in population would be the death of partisan politics, overweight government, top heavy health care, no pension plan, which would encourage folks to manage their own retirement, less traffic, cleaner air, no grease balls on south shore, little crime, plenty of organically grown food for those of us left , around 3k, and no international business and banking corruption, just friendly tourist coming here to Relax…….. I can’t help but feel this is a “The world is ending” piece that isn’t really based in reality. It feels to me like the same thing when people say “Well if we allow gay marriage every one will be gay”. Yes we are having less children and more deaths but what seems to be missing is that people had more children in the past as well. My father is the youngest of 13 and is in his seventies,so at a point there will be more people dieing the being born but it should even out eventually. The question is how do we encourage this to happen soon rather then later? another is working with companies to encourage bermudians to work for them but with that bermuda has reshape itself cause lets face it bermuda is great if your a kid and good for raising families but for the single and young couples (age range 18 – 30something) there is nothing here and is part of the reason people leave the island to live abroad. Something else that I think would help but have no real clue how to do it is lower the cost of living on this island. Only the wealthy get to pass on their genes. And if you think that wealth is equal to intelligence…that would exempt you from passing on your genes. I’m sorry but the point of being a fully developed country is that we will have an ageing population. You will see similar population models to ours around the world. The UK is nearing this, and Germany has already got there. This can’t be avoided without rampant birthing, which would cause the population to explode beyond what we can afford. We just have to learn how to deal with this, and what it will mean for Bermudians. We were all taught this in our IGCSE geography lessons. Get with the program Larry. Actually, Bermuda could easily avoid all of the problems of population decline simply by allowing the expats already on the island and contributing to its economy to stay with their families. But Bermudians made it very clear last spring that such an idea disgusts them. Bermudians would rather shut down the island than treat expats as equals. So yes, you are right: you will just have to learn to deal with it: skyrocketing health care costs, jobs being outsourced, abandoned properties, government unable to pay its debt. You: Go have children. We need you to have more children. Me: I can’t afford it, but ok.
You: The birth rate is rising! Me: I have two children I can’t afford to school or feed because I lost my job in this crazy economy. Not going to happen sir. Let people in and give those been here 20+ yrs status.